Your lemmings in the snow! 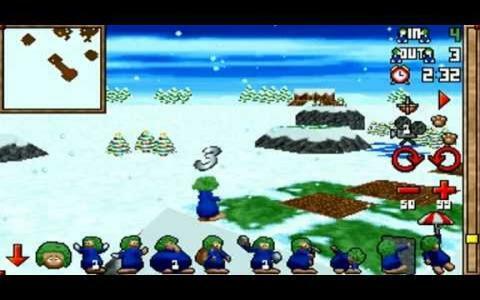 Lemmings 3D Winterland is a game version of Lemmings 3D, which, as the name suggests, is all about winter and about the lands where the lemmings will freeze their lil' asses trying to figure out ways to get to the exit. That's right, the basic gameplay idea of lemmings, of chaining lemmings together so as to allow them all (or in as biggest of numbers as possible) to escape their current level is still the engine that drives this game. What is changed however, is the surroundings. Now, the 3d version of the game, the one that was simple and without no winter clothes, looked and played beautifully, and to that end, nothing has changed in this one either. The lemmings are still as happy to obey your orders, and putting them all to work, building bridges, escalators, stop signs and so on, so the rest of the lemmings can follow around, that same mechanic works great, even in 3D. Because the camera is almost always positioned the right way, so you can see everything that is important and can go about worrying about the puzzle at hand, rather than worrying about not seeing the scenery properly. So, yeah, a great game, great for the winter season. Download it!